Getting tired of seeing all that trash, junk and waste in your house? Want to get rid of it? Worry no more, our E2 house clearance company is here to help you. We are the best option when it comes to getting rid of your garbage. We have fully-vetted and experienced team who can handle all your rubbish in a jiffy. They collect and clear your waste and dispose of it in a legal and responsible way. Our Bethnal Green house clearance services are affordable as we only charge for the amount of waste we collect. Why not give us a call on 020 8610 9182 and let us clear out your house? Book now and benefit from one of our great deals! Looking for the cheapest Bethnal Green house clearance company that can meet your clearance needs? Save time, money and effort by booking our services. 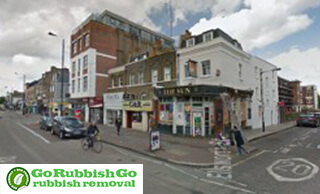 Go Rubbish Go will let you enjoy your free time while we collect and clear the rubbish from your house. Hiring our house clearance E2 services is the most affordable and stress-free way to get rid of your waste. We dispose of it in an eco-friendly and responsible manner in line with the legal regulations. With our professional and solid work experience, you will get more than your money’s worth. Book now to see how much does a house clearance cost! Collecting and disposing of waste is a tedious job. You will need someone to do it for you without wasting your time or money. Hire us and our E2 house clearance team will ensure that your house is rubbish-free while you sit down and relax. We can clear out your house after a home renovation project or if you need to create more space. Whether you want to remove your old furniture or electrical items, we can help. Our Bethnal Green house clearance team are true professionals and they will collect and dispose of your junk the right way. Our services are eco-friendly an affordable and we make the whole process simple and stress-free! Why hire anyone else? Book now and see how we can make your life easier! We are a registered clearance company and keeping the environment clean is our main priority. Our eco-friendly services are guaranteed to impress you! We strive to minimise environmental pollution by recycling and reusing whenever possible. The items which cannot be recycled are taken to the nearest landfill. We also collaborate with local industries to ensure the environment is kept safe. We strive to be the greenest Bethnal Green house clearance company. 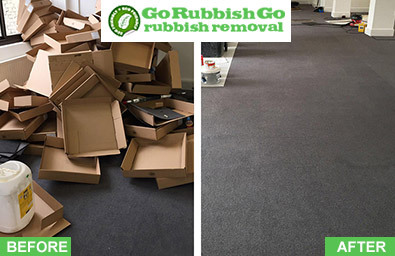 You will never find a greener E2 house clearance company than Go Rubbish Go. Call now and find out more about our commitment to the environment! What Items can Our House Clearance Team in Bethnal Green Remove? Your house can be full of junk and you may be wondering how to dispose of it. Maybe you want to create space for your new sofa and you want to remove the old one. Give us a call on 020 8610 9182 and we will offer you the perfect solution to your problems. Our Bethnal Green house clearance E2 team can handle any amount or type of waste. From heavy and old furniture like beds, tables and chairs to electrical appliances like fridges, ovens and cookers, we can handle them all. We also collect clothes, shoes, CDs, DVDs, books and other household rubbish. We will dispose of them responsibly in an eco-friendly way so that we do not harm the environment. If you have any amount of rubbish that you want to get rid of, give us a call and we will be ready to help you! Our Bethnal Green house clearance company will ensure that you live in a clutter free home by collecting and disposing of your rubbish the proper way. Our team members are fully-vetted and insured so you do not have to worry in the case of an accident during your house clearance job in E2. 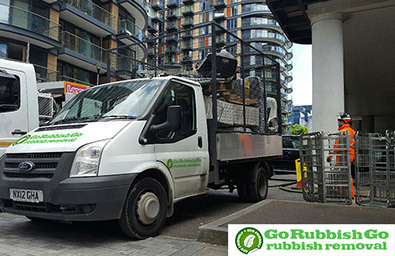 Go Rubbish Go offer a variety of service packages to choose from. We will save you time and money with our professional house clearance services at pocket friendly prices. We will guide you through the process and offer you money-saving deals as soon as you call us on 020 8610 9182! We will come to your house at a time and date that suit your schedule. Book now and get a discount! Bethnal Green is located in the London Borough of Tower Hamlets and 3.3 miles to the northeast of Charing Cross. St John’s Church, the V&A Museum of Childhood and Bethnal Green Library occupy a large part of The Green and Poor’s Land, a vast open space in the area. Globe Town lies east of the district and was developed in the early 1800s to house the growing number of weavers working in the silk weaving industry which thrived in Bethnal Green in the 19th century. The Cranbrook Estate borders Globe Town Market Square and the town has 3 globe sculptures in its three corners. Bethnal Green railway station is served by the London Overground and Shoreditch High Street station is also nearby.